Two people, one of them a policewoman, have been arrested in connection with robbery, murder and being in possession of a stolen car. The car was allegedly presented to the suspects by an All Progressives Congress (APC) candidate in Akwa Ibom State. It was learnt that the stolen Sport Utility vehicle (SUV), a 2010 Honda CRV, said to have been snatched during a robbery operation in which the female owner was killed. The car was allegedly presented to the suspects by an APC House of Representatives flag bearer said to be on the run. The Federal Special Anti- Robbery Squad (FSARS), Oyo State Command, said the owner of the vehicle was among those murdered in an armed robbery attack in the state. 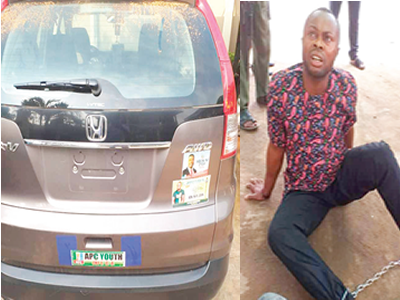 The vehicle was subsequently brought and presented to a man identified simply as Black in Ini Local Government Area by the APC stalwart as an alleged bait to lure him into the party. Some of the policemen, who made the arrest, said on that fateful day, three robbery attacks occurred within the vicinity where all the three owners of the vehicles were gunned down, while the robbers went away with their vehicles. The leader of the police crack team that invaded Akwa Ibom State in search of the stolen vehicles disclosed that the hunt for the other two vehicles was still on. “Now that we have been able to track this one and have gotten it, we will now channel our energy and commit our resources into finding the other remaining two vehicles. All the culprits will be caught and brought to book,” one of them said. It was learnt that some personal effects of the lady, who owned the vehicle such as ID card, complimentary cards, etc., were still in the car. So far, Oyo State Police Command and the police authorities in Ikot Ekpene have taken custody of the vehicle. Black had on the morning of November 23, driven the said car given to him by the APC candidate to a Macaire Resort in Ikot Ekpene, for relaxation when the crack team arrived Akwa Ibom State. The police team traced the car to the resort. Sensing unusual moves and questions about the car, Black escaped with the help of a friend identified simply as Oscar. The policemen then lay siege to the building, mounting surveillance on the car, which had campaign stickers as well as APC insignia. The siege lasted till the next day being Saturday. A man, Mr. Israel Ufia, who was contracted by Black to come and ferry home the car was apprehended by the police. Meanwhile, Black, who was at a primary school in Uruk Uso waiting for Ufia, kept on calling the man on the phone to know if he had succeeded in driving the car out of the resort. Black, however, sensed trouble following Ufia’s inability to respond swiftly and escaped, leaving Ufia’s Camry car with a girl, who was with them. So far, two suspects have been arrested. One of them is a police officer, who is the wife of an APC youth leader. The Akwa Ibom State Police Public Relations Officer (PPRO), Odiko Mac Don, neither picked his calls nor responded to an sms sent to his mobile line to confirm the story. When contacted, his Oyo State counterpart, SP Adekunle Ajisebutu, said he was not aware of the story.